Another installment of “What I Eat When I Don’t Have to Cook for a Man”. Last minute plans for him = massive veggie sandwich for me. I LOVE me a good sandwich and this one has all of my favorite things. I never intended on this being a blog post but it was so simple to throw together, and too good not to share. Enjoy! Put the 1 tsp. olive oil, sliced pepper, onion and minced garlic in a small pan over medium heat. Saute for a few minutes until veggies soften and start to caramelize. While the veggies cook, mash together the avocado with salt and pepper to taste in a small bowl and set aside. Cut your bun in half and brush it with olive oil. Sprinkle each bun half lightly with Italian seasoning and place on a baking sheet. 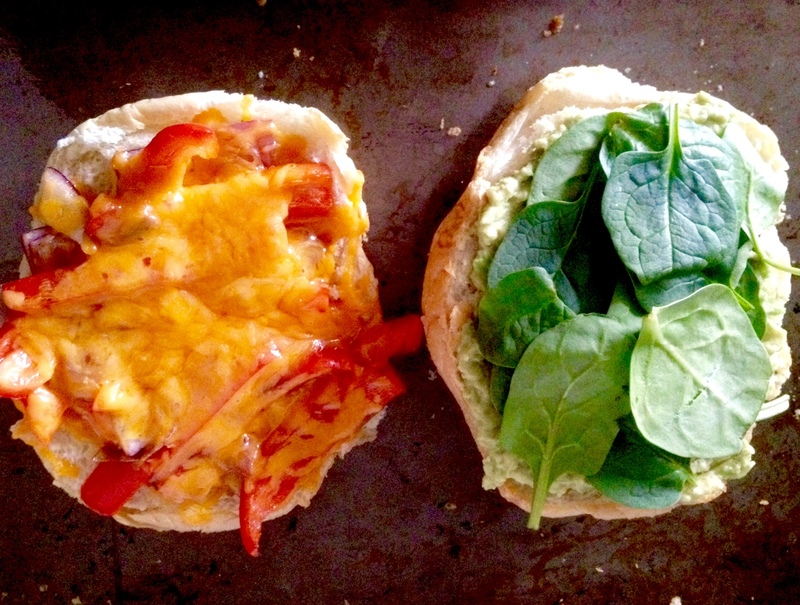 Once veggies are cooked, pour them onto one bun half and sprinkle it with the shredded cheese. Put the bun halves in the oven to bake for 5-7 minutes or until the cheese is melted and buns are toasted. Remove from the oven and spread the mashed avocado onto the bare bun half. Add spinach on top of the avocado and the press the sandwich together. Cut in half and devour.